Me doing a shoulder mount hold. Well 2010 is now well up and running and already my diary is filling with various pole related activities. The events page of the art of dance website is full of master classes, socials and charity events many of which I will blog about nearer the time. Gettng back on the pole after a 3 week break was not as easy as I hoped it would be, my muscles seemed to haf lost half their strength and even my grip seemed weaker. I have had 2 practice sessions with my instructors and am starting to regain some of my strength, I seriously need to work on my parallel and twisted grip handstands as well as my climb to flag invert and Chinese flag. I am sure that with just a couple more sessions I can get back to normal strength and can then start to work on some new tricks and combinations on the pole. I have really enjoyed getting back ino teaching pole dancing and as soon as I have finished this blog I hope to start work on a vigorous new warm up and cool down for my students as well as some evil new session plans. Me trying a gemini varition with a bracket grip on the inside arm. As well as getting the art of dance back in full swing I have been working alongside my husband on the pole dance community website which has started to gain much more support. The site now has a full range of both Xpert and Xsport poles, the latest pole dancing poles from X-pole. We have also been doing lots of research into public liablity and professional indemnity for pole dancing schools and have uncovered some serious gaps in some peoples levels of cover. More to follow on that and the ongoing UK pole dance competition consultation process. Aside from pole stuff I have had the dreaded task of doing end of year accounts, a task which I truly hate! What inspires someone to become an accountant for a living truly baffles me. Before I sign off for today there are 2 more subjects I want to mention, one which is quite amusing and the other which is quite the opposite. I wil start with the one that made me giggle and that was brought to my attention by my husband. There is a facebook group that has been causing some discussion over its title - 'Stop the abuse and christian counseling', I, like many, assumed that the site was aimed at stopping the abuse that is so rife within the christian church but we were wrong. To really understand what I am on about just visit the site using the previous link and enjoy the confusion. This last paragraph is dedicated to my Auntie Jean and her friends and family. Jean was a fabulous lady and a very good friend to my Mum. I have extremely fond memories of Jean and I spent many happy times during my childhood with Jean, Graham and their daughter Emma. I still wear the ring that jean bought back for me from Cancun in Mexico many years ago. I am glad that Jean is no longer suffering from the terrible cancer that had riddled her body but am sure she will be immensely missed by those who knew her. A huge amount of respect must go out to St Luke's Hospice who do an amazing job of helping cancer sufferers in their final days. 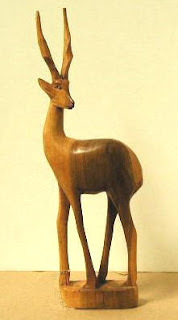 I will leave you all with this picture (wooden antelope pictured left) which would have made Jean chuckle and that hopefully will bring a smile to my Mum's face too!